Alright, here we go. Getting back into the blogging habit. 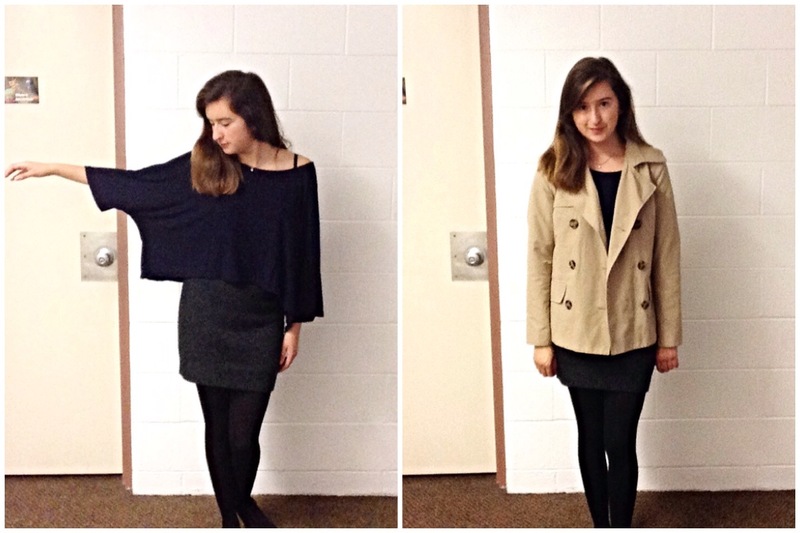 I thought I’d just show you my outfits for the past 3 days, which progressively got warmer and warmer. For Wednesday’s outfit, I was definitely feeling a more dressy outfit with dark colors to compliment the overcast and foggy weather. These are the best pictures I took of my sleep deprived self – I hadn’t had my coffee yet. On top I am wearing this very loose and flowy shirt – it’s basically a circle skirt but with sleeves. I love wearing this because of the variety of ways you can drape it over your torso. On bottom I’m wearing a simple grey sweater skirt thats form fitting, so as to contrast with the looseness of my top. And then I’m just wearing sheer black tights and black flats, because I feel like sweater skirts/dresses look much better against tights than against bare legs. Over everything I am wearing a beige trench coat, and leaving it unbuttoned so that the outfit can peek through. 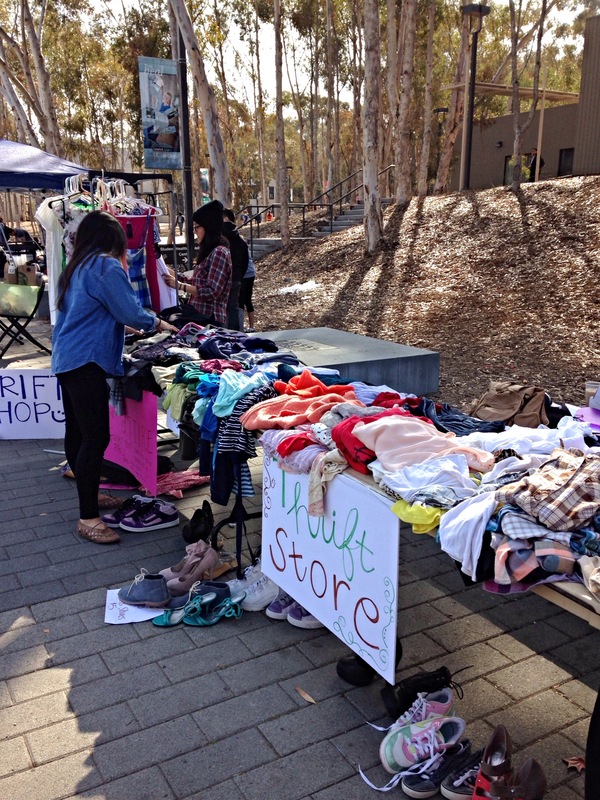 Wednesday afternoon, I was fortunate to stumble upon a thrift sale table that was using the proceeds to pay for a service trip to Honduras. I really love the buttons on the shorts, and I had the perfect light-green jean jacket to go with the top. I went for a very springy, soft toned look, and kept it as simple as possible. On top I am wearing a purple, acid-wash t-shirt from Cotton On, and dark wash skinny jeans which I rolled up. I am really loving acid-wash right now – it makes the material so soft, and adds a minimal amount of grunge to an outfit. 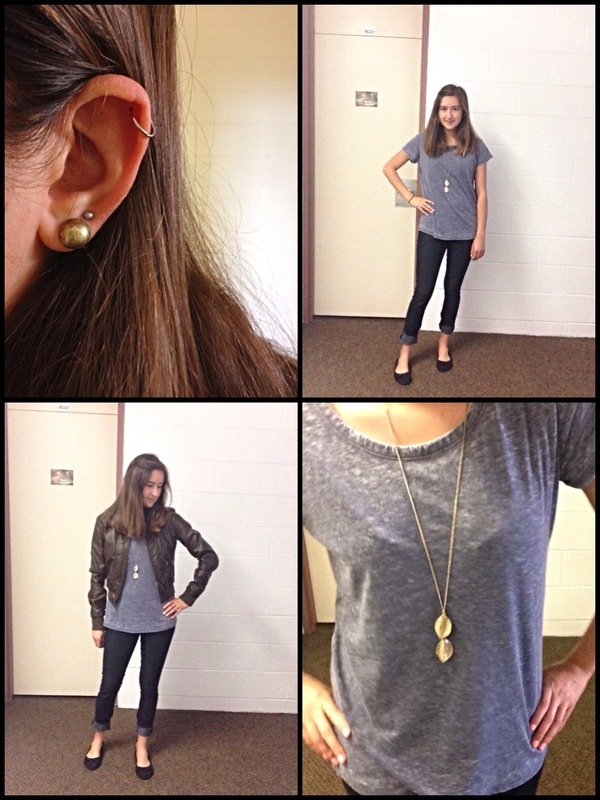 I wanted to keep this outfit simple as well, so I wore a gold leaf necklace from Aerie, and for styling purposes, a brown faux leather jacket. Thanks for reading! Stay tuned for more outfits of the day! I apologize for being M.I.A. for much too long. Life get’s busy. Though I’m going to start posting new stuff soon. I’m actually working for another blog right now, so I technically haven’t stopped blogging all together. If you’re curious to see what I’ve been doing lately, or interested in college fashion, visit Trend Magazine’s fashion blog 🙂 Not all of the photos/interviews are mine, but I have contributed some. Thanks for reading! Recently, Warby Parker asked me to review their newest Spring and Palm Canyon collections, so that is what this post shall be about! I had never heard of Warby Parker, but once I checked out their website, the way they conducted business sounded familiar to me. Turns out my boyfriend had actually tried their products before. 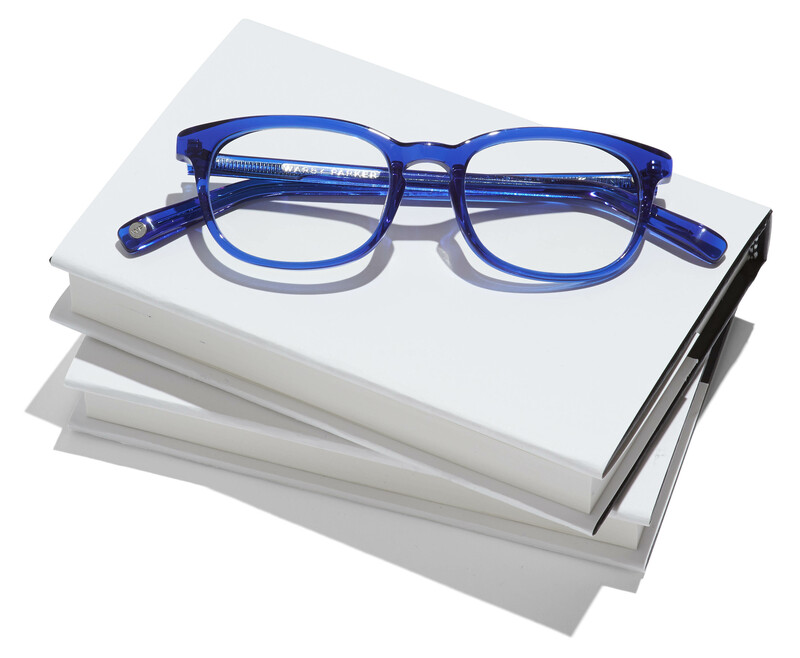 Warby Parker is basically an online eyeglasses/sunglasses shop – both prescription and non-prescription. What I thought was cool is that they send you samples to try on at home for a few days to mimic the feeling of actually trying on glasses at a store. You’re allowed 5 samples, I believe, because you can’t always trust that things on a model are going to look the same on you. In addition, when you purchase a pair of their glasses, they donate a pair to someone in need through their non-profit partners. As for their Spring Collection, I am really loving the different color options they provide. 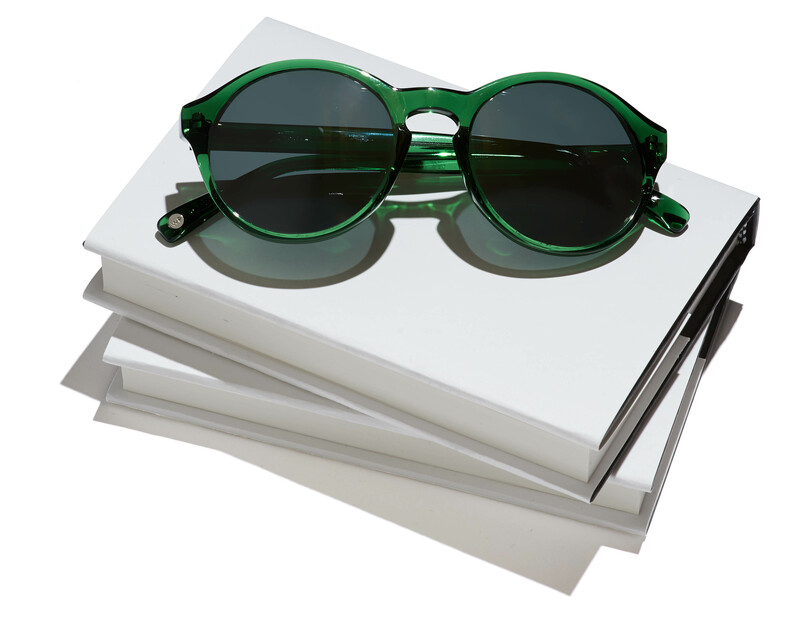 In fact, I am in love with the Quimby sunglasses in Absinthe. I think that these are so stylish and unique for the spring! I love the vintage shape to them, but I am mostly sold on their green color. And some models styling the Spring Collection, to get an idea of how they look on. They have quite the hipster, coffee shop, entrepreneur look to them, and are very trendy in my opinion. As for the Palm Canyon Collection, I’m not a particularly huge fan of this style, but I do think they are fairly chic. This wooden frame trend is still in its early stages, but I think it still has high potential. I saw some vendors selling similar shades on campus, so I wouldn’t be surprised if this look starts hitting stores soon. In addition to the wooden style frames, they have a a frame called Red Canyon that I think is very business woman chic. The shape is very professional and sleek, not too distracting, yet appealing to the eye (ah see how punny I am). All images provided by Warby Parker.